Traditional Thai Massage is an ancient technique with roots in Yoga, Ayurvedic medicine and Buddhist practice. This unique and complete system of Yoga therapy combines rhythmic massage, acupressure, gentle twisting, deep stretching and meditation. Thai Massage helps release tension, increase vitality and create wholeness of mind, body and spirit. A good Thai Massage is deep, stimulating and invigorating, or a wonderful form of relaxation. 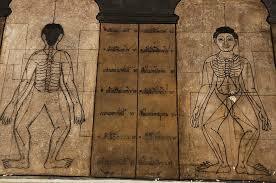 The healing art known as Nuad Boran (ancient massage) began to evolve well over 2000 years ago in present day Thailand. What is today called Thai massage or Thai Yoga Massage is an ancient healing system combining acupressure and energy balancing techniques, Indian Ayurvedic principles, and assisted yoga postures. The founder of Thai massage and medicine is said to have been Shivago Komarpaj, who is said in the Pali Buddhist canon to have been the Buddha’s physician over 2,500 years ago. Among the common people, traditions were passed down verbally, but the royal court probably kept ancient reference texts on the subject of traditional Thai medicine. Sadly, most of these were lost when Burmese invaders destroyed the old capital of Ayutthaya in 1767. The remaining fragments, however were commissioned to be re-drawn as stone etchings by King Rama III in 1832, and today over sixty such epigraphs displaying treatment points, herbal remedies and energy lines are on public display at the famous Wat Po Temple complex in Bangkok.